During embryo development, genes are dynamically, and very precisely, switched on and off to confer different properties to different cells and build a well-proportioned and healthy animal. Fgf8 is one of the key genes in this process, controlling in particular the growth of the limbs and the formation of the different regions of the brain. Researchers at the European Molecular Biology Laboratory (EMBL) have elucidated how Fgf8 in mammal embryos is, itself, controlled by a series of multiple, interdependent regulatory elements. Their findings, published online on February 28, 2013 in Developmental Cell, shed new light on the importance of the genome structure for gene regulation. Fgf8 is controlled by a large number of regulatory elements that are clustered in the same large region of the genome and are interspersed with other, unrelated genes. Both the sequences and the intricate genomic arrangement of these elements have remained very stable throughout evolution, thus proving their importance. By selectively changing the relative positioning of the regulatory elements, the researchers were able to modify their combined impact on Fgf8, and therefore drastically affect the embryo. “We showed that the surprisingly complex organization of this genomic region is a key aspect of the regulation of Fgf8,” explains Dr. François Spitz, who led the study at EMBL. “Fgf8 responds to the input of specific regulatory elements, and not to others, because it sits at a special place, not because it is a special gene. How the regulatory elements contribute to activate a gene is not determined by a specific recognition tag, but by where precisely the gene is in the genome.” Scientists are still looking into the molecular details of this regulatory mechanism. Earth Day may be more than a month away, but another, more personal, ecosystem has been shown to also be worth protecting—within our bodies are communities of microbes that affect the behavior of human cells hosting them. These communities, called the "microbiome," are so crucial to our health that some consider it to be a complex "second genome." Understanding the interaction of these microbes among one another and their human hosts has the potential to yield insights into numerous diseases and complex human disorders from obesity to susceptibility to infection. In a new report appearing in the March 2013 issue of The FASEB Journal, scientists take an important step toward designing a uniform protocol for microbiome research that ensures proper controls and considerations for variations among people. By doing this, future researchers should be able to better assess how what we ingest, whether drugs or food, affects our bodies. "While historically pre- and probiotics have dominated the microbiome landscape, emerging data from numerous labs as to the impact of dietary interventions and antibiotic exposure will play formative roles in tailoring therapy," said Kjersti M. Aagaard, M.D., Ph.D., from the Department of Obstetrics and Gynecology at Baylor College of Medicine in Houston, Texas. "We may find that the answers to our most common and prevalent health and disease states lie not in manipulating the human genome, but rather, in utilizing subtle shifts in diet and components of the diet, efficacy trials in prophylactic or preventative antibiotic therapies, and careful attention to the over prescription of steroids and antibiotics." Dr. Aagaard and colleagues completed comprehensive body site sampling in healthy 18-40 year old adults, creating an unparalleled reference set of microbiome specimens. Preclinical, laboratory studies suggest that a novel immunotherapy could potentially work like a vaccine against metastatic cancers, according to scientists at Virginia Commonwealth University (VCU) Massey Cancer Center. Results from a recent study show the therapy could treat metastatic cancers and be used in combination with current cancer therapies while helping to prevent the development of new metastatic tumors and train specialized immune system cells to guard against cancer relapse. First published online on January 18, 2013 in the journal Cancer Research, the study detailed the effects of a molecule engineered by lead author Xiang-Yang Wang, Ph.D., on animal and cell models of melanoma, prostate, and colon tumors. The molecule called Flagrp-170 consists of two distinct proteins, glucose-regulated protein 170 (Grp170), known as a "molecular chaperone," and a "danger signal" derived from flagellin, a protein commonly found in bacteria. The researchers used modified viruses, or adenoviruses, that can no longer replicate to transport Flagrp-170 directly to the tumor site to achieve localized vaccination. The novel therapy caused a profound immune response that significantly prolonged survival in animal models. "Successfully promoting antitumor immunity will help eradicate tumor cells, control cancer progression, and help prevent tumor relapse," says Dr. Wang, Harrison Scholar, member of the Cancer Molecular Genetics research program at the VCU Massey Cancer Center and associate professor of Human and Molecular Genetics at the VCU School of Medicine. Inspired by a chemical that fungi secrete to defend their territory, MIT chemists have synthesized and tested several dozen compounds that may hold promise as potential anti-cancer drugs. A few years ago, MIT researchers, led by associate professor of chemistry Dr. Mohammad Movassaghi, became the first to chemically synthesize 11,11'-dideoxyverticillin, a highly complex fungal compound that has shown anti-cancer activity in previous studies. This and related compounds naturally occur in such small amounts that it has been difficult to do a comprehensive study of the relationship between the compound's structure and its activity, research that could aid drug development, Dr. Movassaghi says. "There's a lot of data out there, very exciting data, but one thing we were interested in doing is taking a large panel of these compounds, and for the first time, evaluating them in a uniform manner," Dr. Movassaghi says. In the new study, published online on January 24, 2013 in the journal Chemical Science, Dr. Movassaghi and colleagues at MIT and the University of Illinois at Urbana-Champaign (UIUC) designed and tested 60 compounds for their ability to kill human cancer cells. "What was particularly exciting to us was to see, across various cancer cell lines, that some of them are quite potent," Dr. Movassaghi says. The lead author of the paper is MIT postdoc Dr. Nicolas Boyer. Other authors are MIT graduate student Justin Kim, UIUC chemistry professor Dr. Paul Hergenrother and UIUC graduate student Karen Morrison. Many of the compounds tested in this study, known as epipolythiodiketopiperazine (ETP) alkaloids, are naturally produced by fungi. Scientists believe these compounds help fungi prevent other organisms from encroaching on their territory. When it comes to evolution, humans can learn a thing or two from primeval sea lampreys. In an open-access article published online on February 24, 2013 in Nature Genetics, a team of scientists has presented an assembly of the sea lamprey genome – the first time the entire sequence has been decoded. The data is compelling as the sea lamprey is one of the few ancient, jawless species that has survived through the modern era. The paper not only sheds light on how the venerable invasive species adapted and thrived, but it also provides many insights into the evolution of all vertebrates, species with backbones and spinal cords, a group that includes humans, said Dr. Weiming Li, Michigan State University (MSU) fisheries and wildlife professor, who organized and coordinated the team. “Sea lampreys are amazing survivors,” said Dr. Li, whose teammate, Dr. Jeramiah Smith of the University of Kentucky, led the analysis of the genome assembly. “Even though they diverged from our lineage 500 million years ago, they give us a template of how vertebrates, including humans, evolved into the modern species that we have today.” By serving as a bridge to bygone eras, lamprey DNA also provides pathways to many extinct lineages, thus opening the door to decode many prehistoric species, he added. Based on fossil records, the Cambrian period is cited as a dramatic time when life exploded from single-celled organisms to complex, multi-celled creatures. During this time, many species developed jaws and skeletal frames that protected their brain, spine, and nervous system. Some, in fact, even had brains that shared the same basic structures and functions as modern humans. 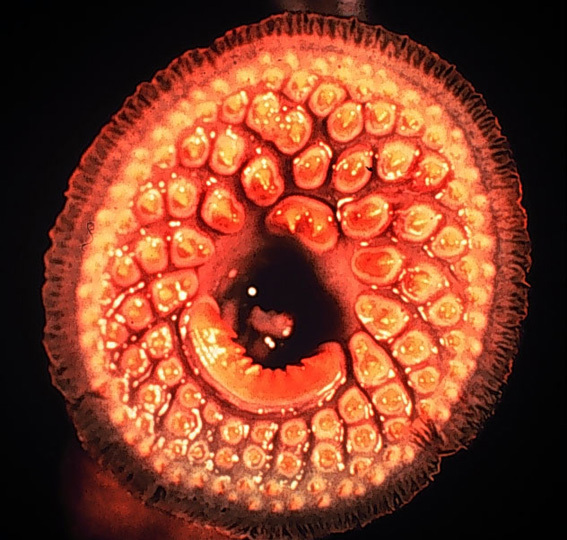 By mapping the sea lamprey genome, scientists may soon better understand how and when humans evolved. Experts have disabled a unique member of the signalling proteins which are essential for the development of the malaria parasite. They have produced a mutant lacking the ancient Shewanella-like protein phosphatase known as SHLP1 (pronounced 'shelph'). This mutant is unable to complete its complex life cycle and is arrested in its development in the mosquito. The discovery could help in the design of new drugs to arrest the spread of this killer disease. SHLP1 is critical to the cellular development of the malaria parasite. It can be found at every stage in the lifecycle of the malaria parasite and for the first time experts led by scientists at The University of Nottingham have analyzed their biological function. Dr. Rita Tewari and her team in the Centre for Genetics and Genomics in the School of Biology have spent three years studying the phosphatase proteins that are important building blocks in the life cycle of the malaria parasite. The findings of their latest study were published online on February 21, 2013, in Cell Reports. Dr. Tewari said: “SHLP1 is absent in humans and can be explored as an excellent target for malaria transmission control. Prevention of malaria transmission to and from the mosquito is vital in order to stop the devastating spread of malaria. Targeting SHLP1 could be an important step to achieve this goal.” Although great strides have been made in reducing the number of deaths from malaria, half the world’s population remains at risk from the disease. In 2010, 90 per cent of all malaria deaths occurred in Africa — mostly among children under the age of five. Dr.
For years, researchers have been searching for a way to treat diabetics by reactivating their insulin-producing beta cells, with limited success. The "reprogramming" of related alpha cells into beta cells may one day offer a novel and complementary approach for treating type 2 diabetes. Treating human and mouse cells with compounds that modify cell nuclear material called chromatin induced the expression of beta cell genes in alpha cells, according to a new study that appeared February 22, 2013 online in the Journal of Clinical Investigation. "This would be a win-win situation for diabetics - they would have more insulin-producing beta cells and there would be fewer glucagon-producing alpha cells," says lead author Klaus H. Kaestner, Ph.D., professor of Genetics and member of the Institute of Diabetes, Obesity and Metabolism, Perelman School of Medicine, University of Pennsylvania. Type 2 diabetics not only lack insulin, but they also produce too much glucagon. Both type 1 and type 2 diabetes are caused by insufficient numbers of insulin-producing beta cells. In theory, transplantation of healthy beta cells – for type 1 diabetics in combination with immunosuppression to control autoimmunity - should halt the disease, yet researchers have not yet been able to generate these cells in the lab at high efficiency, whether from embryonic stem cells or by reprogramming mature cell types. Alpha cells are another type of endocrine cell in the pancreas. They are responsible for synthesizing and secreting the peptide hormone glucagon, which elevates glucose levels in the blood. "We treated human islet cells with a chemical that inhibits a protein that puts methyl chemical groups on histones, which - among many other effects - leads to removal of some histone modifications that affect gene expression," says Dr. Kaestner. An international research team coordinated at the IRCM (Institut de recherches cliniques de Montréal) has found a possible alternative treatment for lymphoid leukemia. Led by Dr. Tarik Möröy, the IRCM’s President and Scientific Director, the team discovered a molecule that represents the disease’s “Achilles’ heel” and could be targeted to develop a new approach that would reduce the adverse effects of current treatments such as chemotherapy and radiation therapy. The study’s results were published online on February 11, 2013 in Cancer Cell. The researchers’ results have direct implications for the treatment of acute lymphoblastic leukemia (ALL), one of the four most common types of leukemia. ALL is a cancer of the bone marrow and blood that progresses rapidly without treatment. Current treatments consist of chemotherapy and radiation therapy, which are both highly toxic and non-specific, meaning that they damage healthy cells as well as tumor tissues. “Even when effective, patients can suffer dramatic side effects from these treatments,” says Dr. Möröy, who is also Director of the Hematopoiesis and Cancer research unit at the IRCM and corresponding author of the study. “Therefore, they would directly benefit from an improved therapy that could reduce the necessary dose of radiation or chemotherapy, and thus their side effects, while maintaining the treatments’ efficacy. Therapies that target specific molecules have shown great promise. This is why, for the past 20 years, I have been studying a molecule called Gfi1, which plays an important role in the development of blood cells and cancer.” When normal cells are transformed into tumor cells, the body responds by activating a tumor suppressor protein that induces cell death. MIT engineers have created genetic circuits in bacterial cells that not only perform logic functions, but also remember the results, which are encoded in the cell’s DNA and passed on for dozens of generations. The circuits, described online on Februay 10, 2013 in Nature Biotechnology, could be used as long-term environmental sensors, efficient controls for biomanufacturing, or to program stem cells to differentiate into other cell types. “Almost all of the previous work in synthetic biology that we’re aware of has either focused on logic components or on memory modules that just encode memory. We think complex computation will involve combining both logic and memory, and that’s why we built this particular framework to do so,” says Dr. Timothy Lu, an MIT assistant professor of electrical engineering and computer science and biological engineering and senior author of the Nature Biotechnologypaper. Lead author of the paper is MIT postdoc Dr. Piro Siuti. Undergraduate John Yazbek is also an author. Synthetic biologists use interchangeable genetic parts to design circuits that perform a specific function, such as detecting a chemical in the environment. In that type of circuit, the target chemical would generate a specific response, such as production of green fluorescent protein (GFP). Circuits can also be designed for any type of Boolean logic function, such as AND gates and OR gates. Using those kinds of gates, circuits can detect multiple inputs. In most of the previously engineered cellular logic circuits, the end product is generated only as long as the original stimuli are present: Once they disappear, the circuit shuts off until another stimulus comes along. Dr. Lu and his colleagues set out to design a circuit that would be irreversibly altered by the original stimulus, creating a permanent memory of the event.